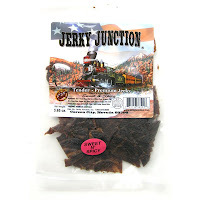 Jerky Junction is a brand of Jerky Junction, Inc., based out of Carson City, NV. The brand has been around awhile, going back to about 18 years now. It's run by Andy Baird and his son Kyle, and Andy's brother Ian. Baird had been in the restaurant industry and had wanted to start his own business in the food industry, and picked jerky. The train theme comes from his love of trains, which stemmed from his grandfather Walter Baird, who invented the first electric light for trains. Just a year ago, Jerky Junction opened up its first retail outlet in Truckee, CA, inside an old train caboose. This particular package of Sweet & Spicy is from the brand's "Clear Bag" line, which is a slab-style jerky cut up into small pieces. It's manufactured by Country Archer in Grand Terrace, CA. Jerky Junction offers other lines and varieties of jerky. The first thing I taste from the surface of these pieces is a moderate amount of sweet, followed by a light bit of saltiness. I can pick up light amounts of spiciness. There's a "beefy" flavor as well. The chewing flavor starts with more of the "beefy" flavor. Much of the sweetness has subsided after having sucked on a piece before chewing. If I chew a piece immediately after putting a piece into my mouth, I tend to get an even mixture of sweet and beefy flavor. For being dubbed a "Sweet & Spicy" beef jerky, I think it's holds up to that description. It's definitely sweet. There's a good deal of it noticeable upon first putting a piece into my mouth. But that sweet tends to wear off quickly, and about half-way into the chewing it seems to be about all gone. The spiciness is there as well, but it's not really hot at all. It's mild, but there's a spicy tingle that shows up well. That "beefy" flavor I described above is quite noticeable throughout the chewing. I don't want to call it a "natural meat flavor", even though it certainly stems from the meat. Rather, it doesn't really taste like steak, it has a more stale, old flavor. I think much of that stale flavor comes from the streaks of fat I see on several of these pieces. The fat itself has a clearly stale flavor, which seems to spread into the meat. The freshness date on this package says, "111910" which I assume is November 19, 2010, so it's not past its date. The saltiness in this seems moderate. It's probably higher than it actually tastes due to the heavier sweet flavor. The garlic is slightly noticeable too in the form of a light aftertaste. I can also detect a light black-pepper aftertaste. Overall, the dominant flavor that I notice the most is the sweet, in that it seems to sit in the middle of my palate. The spiciness is easily noticeable as well, but tends to color that sweetness. The "beefy" flavor I described above is perhaps the second-most dominant flavor. Typically, you'll notice the heavier sweet at first, but it wears off quickly, and the beefy flavor is what you'll end up with. These are slices of whole meat, sliced thin in slab style, and cut into bite sized pieces. 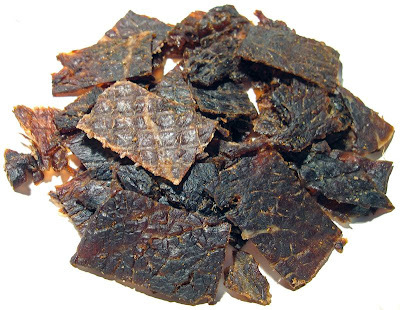 This is a dry jerky with a dry surface feel, but with a soft, and very flexible consistency. Pieces are easy to tear apart with my fingers, though their bite-sizes means you don't have to tear them apart. Ease of chewing seems moderate. The chewing texture starts out feeling like soft flexible rubber, almost gummy-like. There's a fair amount of initial chewing resistance, and then starts chewing down to a soft mass. At that point, it does not chew like steak at all. It has some meat-like feel, but it's mostly a mixture of mushy and gummy. 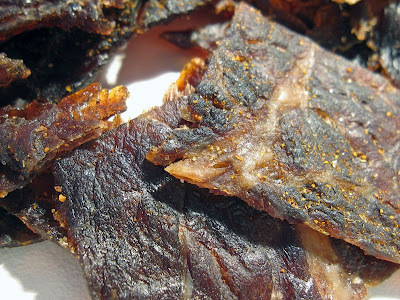 There's several pieces of jerky with significant streaks and chunks of fat, and this fat has an old/spoiled flavor that affects the overall flavor of the jerky. Otherwise, I don't find any tendon or gristle in jerky, and nothing unchewable or stringy. It's also clean eating, I got only a trace amount of seasoning on my fingers, and very little anything falling off on to my lap or desk. I paid $5.99 for this 3.65oz package at a roadside fruit stand in Pala, CA. That works out to a price of $1.64 per ounce. For general jerky snacking purposes, at the $1.64 price per ounce, it's a fair value. I'm not really getting much snackability out of this, mostly due to that stale/old meat flavor, and it's mushy/gummy chewing texture. That $1.64 price per ounce is actually slightly lower than what you'd expect to pay for national brands of jerky at grocery stores, and I think the quality reflects that. For being a "Sweet & Spicy" beef jerky, at the same $1.64 price per ounce, it's a decent value. I do get plenty of sweet, and a fair amount spiciness too. If what you want is a sweet & spicy jerky, I think you'll get your money's worth. This Sweet & Spicy beef jerky from Jerky Junction has a stale meat flavor that seems to stem from a significance of stale-tasting fat. I've had plenty of jerky manufactured by Country Archer, but it's always been their brisket-cut jerky in the gold bags that I've had, and I've always found that to be pretty good. But this stuff in the clear bags is not impressive at all. It definitely seems to fit the bill as a Sweet & Spicy jerky, it has a lot of sweet, and a good deal of spiciness. It's not hot at all, more like mild, but where the spiciness presents a lot of tingle. There's a noticeable garlic and black pepper aftertaste. The chewing texture is rather poor, feeling more mushy and gummy than anything else, and very little like steak. It's easy to eat with its bite-sized form, however. I didn't give this a "Dog Treats" rating only because I found it still tolerable to eat. Perhaps Jerky Junction's other lines, such as their gold bags, silver bags, and their wild game jerky might be a lot better. My recommended beer pairing for this, I keep wanting a darker Belgian style ale, like a dunkel.